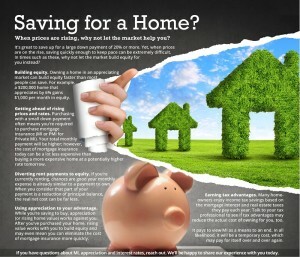 Home » Blog » Saving for a home? When prices are rising, why not let the market help you? It’s great to save up for a large down payment of 20% or more. Yet, when prices are on the rise, saving quickly enough to keep pace can be extremely difficult. In times such as these, why not let the market build equity for you instead? Building Equity. Owning a home in an appreciating market can build equity faster than most people can save. For example, a $200,000 home that appreciates by 6% gains $1,000 per month in equity. Getting ahead of rising prices and rates. Purchasing with a small down payment often means you’re required to purchase mortgage insurance (MI or PMI for Private MI). Your total monthly payment will be higher; however, the cost of mortgage insurance today can be a lot less expensive than buying a more expensive home at a potentially higher rate tomorrow. Diverting rent payments to equity. If you’re currently renting, chances are good your monthly expense is already similar to a payment to own. When you consider that part of your payment is a reduction of the principal balance, the real net cost can be far less. Using appreciation to your advantage. While you’re saving to buy, appreciation (or rising home value) works against you. After you’ve purchased your home, rising value works with you to build equity and may even mean you can eliminate the cost of mortgage insurance more quickly. Earning tax advantages. Many home owners enjoy income tax saving based of the mortgage interest and real estate taxes they pay each year. Talk to your tax professional to see if tax advantages may reduce the actual cost of owning for you, too. It pays to view MI as a means to an end. In all likelihood, it will be a temporary cost, which may pay for itself over and over again. If you have questions about MI, appreciation and Mortgage interest rates, reach out. We’ll be happy to share our experience with you today.